“Don’t give up! Don’t quit! 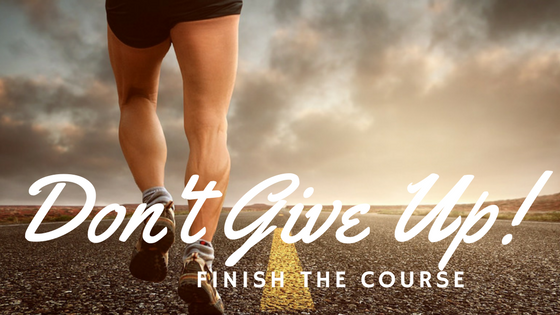 Finish strong!” I have no idea how many times those words were whispered, spoken, or even shouted to me. Yet too often, I have quit too soon. “So let’s not get tired of doing what is good. It is hard to stand firm when you feel like you are being pulled in, dragged down, or run over. Born into poverty, Lincoln was faced with defeat throughout his life. He lost eight elections, twice failed in business and suffered a nervous breakdown. He could have quit many times – but he didn’t and because he didn’t quit, he became one of the greatest presidents in history. 1816: His family was forced out of their home. He had to work to support them. 1832: Ran for state legislature – lost. 1832: Also lost his job – wanted to go to law school but couldn’t get in. 1833: Borrowed some money from a friend to begin a business and by the end of the year he was bankrupt. He spent the next 17 years of his life paying off this debt. 1834: Ran for state legislature again – won. 1835: Was engaged to be married, sweetheart died and his heart was broken. 1836: Had a total nervous breakdown and was in bed for six months. 1838: Sought to become speaker of the state legislature – defeated. 1840: Sought to become elector – defeated. 1843: Ran for Congress – lost. 1846: Ran for Congress again – this time he won – went to Washington and did a good job. 1848: Ran for re-election to Congress – lost. 1849 Sought the job of land officer in his home state – rejected. 1854: Ran for Senate of the United States – lost. 1856: Sought the Vice-Presidential nomination at his party’s national convention – got less than 100 votes. 1858: Ran for U.S. Senate again – again he lost. Thomas Edison’s failed 32,000 times before he invented the phonograph. Theodor Seuss Geisel, Dr. Seuss, had his first book rejected by 27 different publishers. Henry Ford endured a couple of failed automobile businesses. Colonel Harland David Sanders was fired from dozens of jobs before founding a fried chicken empire. The bible also has a long list of its own of social failures who names are now synonymous with success: Moses, David, Jonah, Peter to name a few. and the sin that so easily entangles. fixing our eyes on Jesus, the pioneer and perfecter of faith. and sat down at the right hand of the throne of God. I’m not sure if any of you needed this little pep talk today, but there are times and seasons when I need to encourage myself to keep going. Reminding myself that life is a marathon, not a sprint, prepares me to get up and go again. more resilient that you can imagine. You are not running the course in vain.